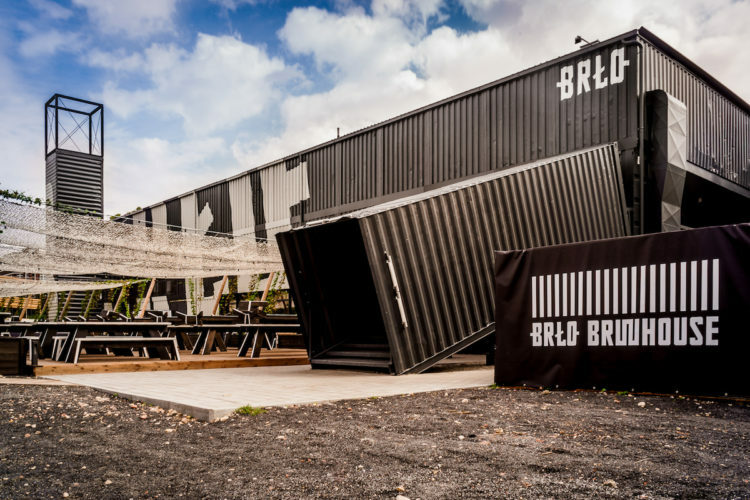 The young Berlin based craft beer brand Brlo needed a home for its beer. The plot of land located in Gleisdreieck Park, leased for a limited time so that the temporary structure can easily be dismantled and assembled elsewhere, was crucial in the selection of shipping container usage. And so, the unique Brlo brewhouse mobile brewery was born! Utilizing the structure and aesthetic of used shipping containers, the design gives out a sleek and compact look with highlights such as a steel skeleton tower construction and a slanted container that holds the main staircase. The brewhouse also contains actual beer production facilities and a bar, as well as a restaurant with a modern kitchen adjusted to craft beer lovers. Last but not least, the beer garden and its stage are ready to host cultural and entertainment events.